Meet this boy in this picture. And, see his picture closely. He is Aman and 15- year-old. Full of energy and confidence Aman studies in Class IX at Vishwa Bharti School, Greater Noida. He wears an infectious smile and not let you take any expression of sympathy for him. He is creative despite his handicap and that too a severe one. He does his work all by himself and becomes a bit distressed when it comes to tying shoe laces or buttoning his shirt. But he found a solution too. He doesn’t wear shoes with laces and wears T shirts only. He is popular amongst his school friends too. 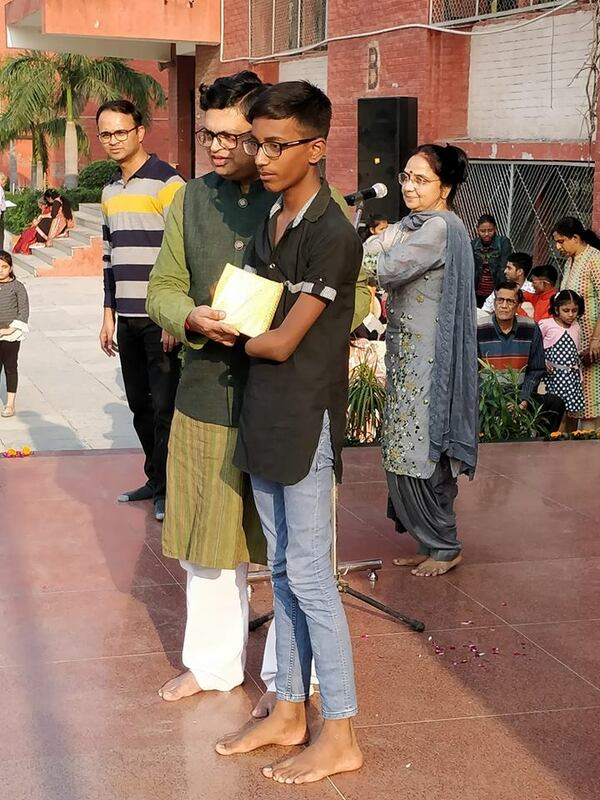 I met him yesterday at Chinmaya Mission, Noida painting competition. There was something magnetic in him which made me to speak with him. He made me very comfortable narrating his story as to how did he nearly miss an opportunity to take part in this competition on Sunday. But he was gleaming after he could participate in it. I just casually asked him what would he aspire to be. But probably that was not a very comfortable question for him. With a bit sullen voice he replied, ‘I have not thought about it but I know my limitations’. I could sense the sensitivity involved in my question and also the discomfort in his answer. I further probed about his family and his native place. With this question his energy levels rose up and he started to talk about his father with great reverence. Without any inhibition he said,I belong to an economically weak family and my father does a small job in a factory in Greater Noida. He doesn’t earn much but he takes our good care’. Choked a bit with emotions I asked the most dreaded question. How did you lose both your hands? Probably he had answered this question many times before so he didn’t blink and said,’I fell from a moving train while I was just 7-year-old and lost both hands’. But he also didn’t forget to remind me that he is self-reliant and lives with dignity without depending on anyone. Further I asked him whether he ever consulted a doctor to get artificial limbs. He answered in affirmative. He said the cost of getting artificial limbs is exorbitant and his family with limited means can’t afford it. He comforted me further by telling me but he is not disheartened and he is preparing himself to live with limitations. By this time my heart and mind started to make me feel really proud for this boy’s sense of confidence and dignity. I just sheepishly asked him how much would be required to get him artificial limbs. He said that according to doctors a few lakhs. I genuinely wanted to contribute for this child who has so many years to look forward to living a decent life. Chinmaya Mission Noida and its members would be doing their bit for this boy. I wrote about Aman on Facebook because I thought many of the friends may have something better for Aman. Please come forward to suggest how Aman could get back his normal life and a bright future.